Do You Have Dangerous Mold In Your Bathroom? Mold grows anywhere that there is a food source and moisture. Add in the warm temperature and humidity of a bathroom, and you have the perfect environment for mildew and mold growth. In bad cases, a bathroom may have an earthy smell. This is usually from rotting wood. Not all mold can be detected by smell. You should never sniff mold. 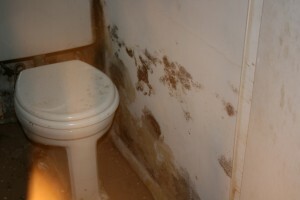 Breathing bathroom mold can cause serious health problems. Poor tiling and calking jobs can leak. Water that gets behind tiles can cause rot. If you see cracks in your caulking, that is an indication that water has been making its way behind the shower walls. If you find small ants in your bathroom or tub, this is a sign you may have hidden mold under your tiles or floorboards. – Control humidity to prevent bathroom mold. Ventilation is important. A bathroom fan will draw excess steam from your bathroom. Be sure that your fan is installed properly. – When finished showering, towel-dry surfaces with excess moisture. Use a squeegee on the shower walls. – Keep your bathtub free of ‘stuff’. Shampoo and conditioner bottles, body wash, razors, shaving gel, washcloths, loofah sponges and other items in and around your bathtub provide places for moisture to accumulate and mold to grow. – Keep your towels clean and wash bathroom rugs frequently to prevent mold from forming. – Use a mildew resistant shower curtain. Wash and replace it as needed. – Clean regularly and promptly clean up any water or liquid spills. – Let some light into your bathroom by opening curtains if there is a window. If there is no window, leave a light on occasionally, preferably one that is energy-efficient.The EPA warns that the longer mold grows, the more health damage it can cause. If you think you have a troublesome mold problem in your bath, get help now! H&H Environmental Construction and Consulting provides professional mold testing and removal services for Connecticut, Massachusetts, New York, New Jersey and Pennsylvania. Call us at 888-250-6653 if you suspect a mold or mildew problem anywhere in your home!